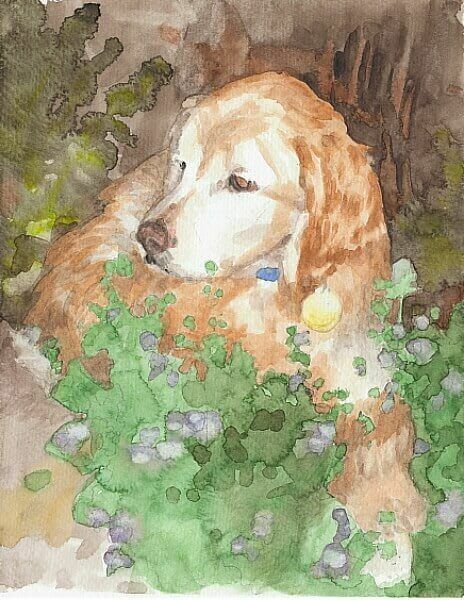 When I finish a watercolor portrait like the portrait above, I always critique it by comparing it closely to a reference photo supplied by the customer. First I look for an overall match between the photo and the painting. If the photo and the painting do not match, I zoom in on an area that matches least and glance at that area rapidly between the photo and the painting to see how I can align my painting to the photo. I make repairs. And I zoom in on the next mismatched area, glance back and forth, repair, and repeat until the overall impression between the painting and photo matches. I see if the the overall impression I get from the painting matches my 'focus.' Focus as I explain in my lesson on 'painting process' is the thing I tried to convey about the subject, and in this case it is what struck me most about the subject when I first viewed the customer's photo. 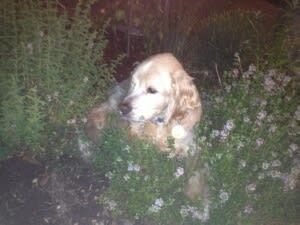 I was most struck by how softly the dog was situated among the delicate plants in the herb garden. So my focus was soft and delicate. I tried to achieve this soft and delicate focus by running the garden colors/objects together to create the look of a blanket. I check both 'likeness' and 'focus' using a specific technique . . . I always critique a finished painting with fresh eyes, anew in the following ways so areas mismatched to the reference photo stand out. 1) Squint. Squinting blocks the detail and lets me see the 'bigger picture' like composition and light movement, which I sometimes forget while focusing on the details. 2) Turn my painting upside down. Since I tape my watercolor painting and reference photo to a board, I can spin the board around. While upside down, the painting and reference photo look different and as such are easier to compare for accuracy. 3) Hold my painting and photo to a mirror. Looking in a mirror makes a watercolor portrait and a reference image look completely different because the view in a mirror is at a greater distance and reversed. As a result comparisons for accuracy in a mirror in my opinion allow for the best critique. 4) Next Day. I compare my painting to it's reference photo the next day. Next day wipes away much of my memory of the painting details making the painting look fresh. When it looks fresh, problem areas stand out.